The new year is always a good time for reflection. We often take a fresh look at our health, our relationships, and our personal goals. As a small business owner, it makes sense that we use this time to reflect on our business and what we want and need. An audit of your social media marketing is one of the best ways to ensure that 2019 is the best year yet for your small business. It’s a good time to make sure that everything on your social media pages is accurate and optimized! Who has access to your accounts? Just you? Past employees or old acquaintances who said they’d help out and never did? Do you know all of your passwords? Find ‘em and write ‘em down if you need to. Check all of the information on your pages - website addresses, phone numbers, hours and location. Update header images - it’s good to give them a good clean and refresh. Sizzle those puppies up. Download our free guides for help. Reflecting on how you used social media in 2018 will help you determine whether it was a success or a flop and what direction you want and need to go in 2019. To increase your customer base? What do you want social media to do for you in 2019? It’s likely that you were and are hoping to do most if not all those things, so you have to examine your social media and its purposes. Then explore changes to make and how to move forward in 2019. Spend some time looking at your social media accounts. Check out your profiles. Do they represent who you are today? Are they consistent across the channels or are you sending mixed messages? 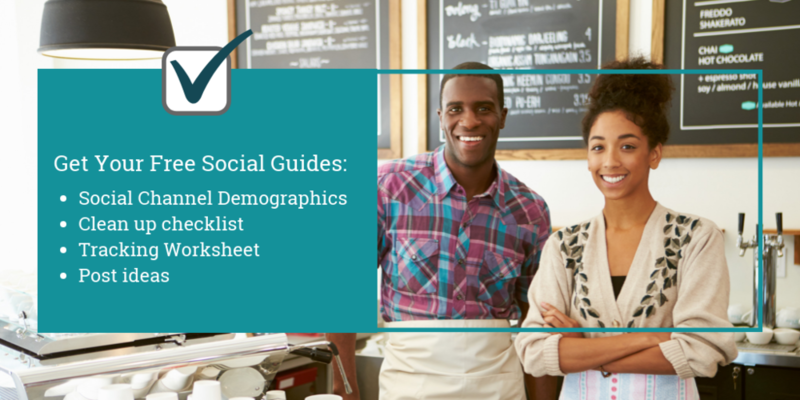 Do your profiles focus on the demographic that you are trying to reach? Is everything current and identical across the various channels? When reflecting on a goal, it is always best when you have some sort of concrete measurement to use to determine success. Many of the social media channels have measurement tools you can use to determine how much activity your social media is attracting. They can usually be found under your profile. Take the time to reflect and record those measurements. Use a four month window as a baseline, and then continue to check back to see how activity has grown or changed. Take a look at your postings and reflect on whether or not you are posting too little or too much. Look at which types of posts are engaging your customers and eliciting positive feedback. And yes, you need to reflect on which channels and posts aren’t working well or are received negatively or have non-existent feedback. Ask yourself if the channel is wrong for your business or consider that it might be the way you are trying to engage the demographic of that channel. After you have looked at the measurements for activity, examine the posts and their effectiveness, and reflect on the channels themselves; it’s time to make a plan for 2019. How and what should you change about your current plan? Are there any channels you should engage in? Do you need to focus more on one particular channel? Should you nix activity all together on any of the channels? Do you need to change the kinds of postings you are putting out there? Take action to make sure that you are measuring your activity, examining the engagement, and seeing the results-new customers, increased sales, return customer activity, or the achievement of whatever goals you set. Write down the action plan and create an editorial calendar that will help you to meet all your 2019 goals. And, if this is all too much for you with everything else you have to do to keep your small business thriving then consider hiring an outside expert. Let them take all this off your plate so you have more time to focus on those new 2019 health and personal happiness resolutions. The new year is here, and there is no better time than today to reflect and plan for your business’ continued success. Older PostWhy email? It's an offer you can't refuse.